Adobe Dreamweaver CS6 is a HTML editor, web development, and designing software by Adobe system released in 21st April 2012. It is the best web editing software in the market and is easy to use. In this tutorial, I will help you to connect your WordPress (Content Management System) website to Dreamweaver CS6 so that you can edit your website’s wordpress themes as per your needs. The screenshots will make your work easier, below are the things you will need. · A domain name with hosting. · Adobe Dreamweaver CS6 or CS5. If you have all the above things on your system then you are good to go. Let us get started with our tutorial. This tutorial will be divided in two sections for the convenience of understanding. 1. Open Dreamweaver CS6 and go to Site tab and select New site and there you will see New site setup. 2. Now enter the Site Name as you wish and Locate a folder where you want to store all the data. 3. Select Servers tab and click the + button at the bottom and the Server setup window opens. 4. Type a server name as you wish, it can be anything. 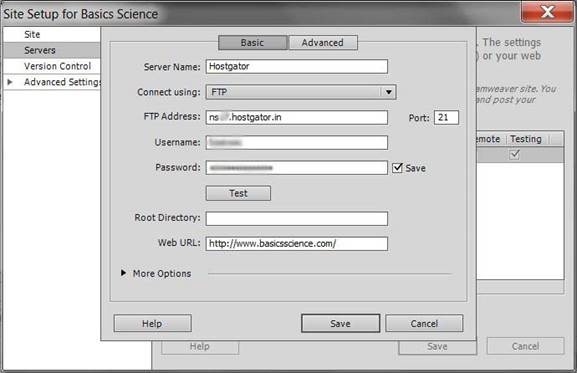 Then Connect using > FTP and for FTP address you should enter the server address that your hosting provider has given you (Check your email inbox) and type it there without any errors. 5. Now as you have Hosting service at your website, you must have a unique Username and Password that you have to enter it in those fields. Then click the Test button to verify your details. 6. Leave the Root Directory option blank and proceed to Web URL. Here enter your Web URL (Your domain name). 7. Go at the top again, switch from Basic mode to Advance, and select the Server Model as PHP MySQL. Rest options are not to be changed. 8. Save your details. There is no need to change other options click Save and the Setup will close. Dreamweaver will import the necessary data and server details, and in minutes, you will see those files at the right side bottom of the window. Great, you have successfully added your website to Dreamweaver CS6. Note: If you cannot verify your login details expand the More Options check Use Proxy, Use Passive FTP, Use IPV6 or try disabling you firewall as it may be interrupting the connections. If the problem persists let me know at the comments box I will be happy to help you. 2. At the Remote Server (Right hand side bottom of the window), select index.php file. Then the code will appear but you will see a notification at the top which reads as ‘This page may have dynamically-related files that can only be discovered by the serve.’ Select Discover and still you may see another notification but it is because we do not have our website in the directory, we have it on the hosting server, so select the Live button, which is above the notification. Thus you see your website live. 3. Now a window pops up ‘Update on Testing Server’ click Yes again another window pops up ‘Dependent files’ click Yes. 4. Select the split view so that you can see your website and its code at the same time. If you see error page then try inserting your homepage address in the address bar. Congratulations, you have added your wordpress website to your Dreamweaver CS6. You can edit your HTML or CSS codes to customize your wordpress theme. If you have any problems regarding the setup, comment below and I will try my best to help you to solve them. The website used in this tutorial is Basics Science. There is some issue with websites that are set up with wordpress. The Dreamweaver shows the above error if your Premalink settings are customized to avoid it change it to Default. Please follow the screen shot. Previous Post Recommended WordPress Plugins. Next Post Blogging tips for Beginners. Hi. I cannot find the index.php in the remote server. Done adding wp to dreamweaver. (Thanks to u) Just few more (stupid) questions. Sorry im quite noob on html and wordpress. Learning here. 1) The default is in (index).php? Can i change it .html? 2) How do i save the file after coding? Overwrite index.php? *now home.php will be considered as a default home page to load from the server directory…. Hi . I followed your instruction and for some reason when i click the index php file which is only 1kb my site doesnt show up just a blank page with the word body in the top left corner. where am i going wrong??
. This is incredibly frustrating. Now I am no sure what code exactly is written in your index.php file…making it look blank. Every time I try to ‘discover’ the dynamically-related files, it says it was cancelled. I have set permalinks to default but still no luck? Hi, I tried to sync my WordPress to my Dreamweaver but am unable to. Apparently it could be my firewall or FTP user limit is up. I’ve disabled the Firewall. Still nothing. Use Proxy, Use Passive FTP, Use IPV6 (Done). Still nothing. I am currently having this one problem. As a favor to a friend, he asked to make a few webpages for his assignment. Time is running out for me to make it fully using Dreamweaver. So I made them using wordpress. Just in case his lecturer won’t accept it, do you know how to convert it to a format acceptable to Dreamweaver? I tried copying the html page source straight to Dreamweaver but it’s kinda messed up. Guess it’s not as simple as that. Any suggestion? Hi Shirish, I have accidentedly choen user.php instead of index.php. and now I have a msg that pop up that said denamically-related file could not be resolved because the site definition is not correct for this server. 404 not found. what shall I do now? thanks. As a student, you can have access to all of Adobe’s CC programs, including Dreamweaver, for $29.99 per month–includes all updates, too. It is not that much more if you are not a student. It’s the only way I could have all of the programs from Adobe that I use every day. I just do not know where you are finding this “Remote Server”? and therefore cannot select index.php file. This may be a silly question, but how do you edit the php WordPress pages in Dreamweaver? Everything works fine, testing server running, no server errors, all pages display fine etc. The only work around that I can think of is to open preview the page in a browser, save it as html, and add the necessary css attributes to the html page which does not seem to be the most practical way to do it. If you have any suggestions it would be much appreciated. I did everything as you said until the last step and dreamweaver crashed. 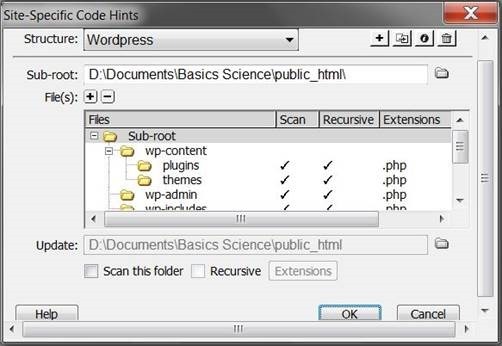 Everything online talks about installing wordpress and the PHP Wamp…. I wonder what went wrong and if the file needs to be in the Local host folder? Wow! your explanation worked perfectly for me. I ve been on this issue for weeks now until i stumbled on your post. You rock! Thanks …..